Preheat oven to 400 degrees F. Slice the potatoes thinly without cutting all the way through the bottom. Place the potatoes in a casserole dish. Stuff the onions inside the potato slices. Brush olive oil over the potatoes and season with black pepper, thyme, and garlic salt. Bake the potatoes, uncovered, in the oven for 1 hour, or until tender in the middle and crisp on top. Remove from oven. Mix melted butter with bread crumbs in a small bowl then scoop mixture on to potatoes and sprinkle with parmesan cheese. 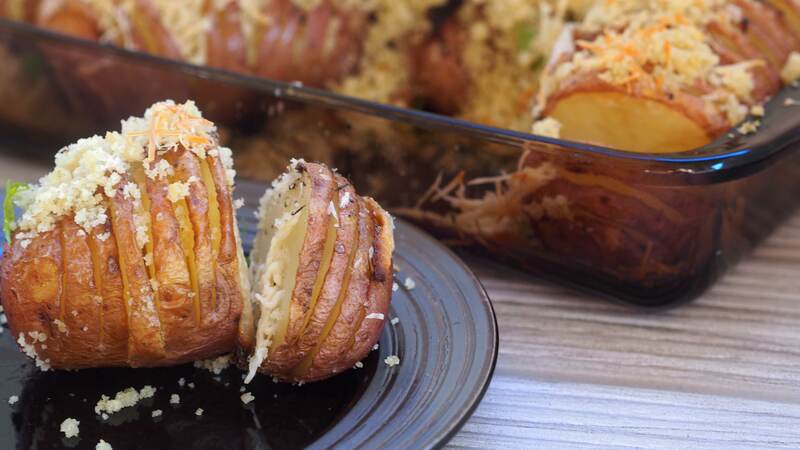 Place potatoes into oven, uncovered, and cook until the topping is lightly browned, about 10 minutes. Remove from oven and serve.